We offer an extensive range of Exhaust Parts that are manufactured using the forging and machining process with superior quality material. These are designed and developed with advanced technologies and are acknowledged for durable finish standards, dimensional accuracy, unsurpassed performance and high tensile strength. 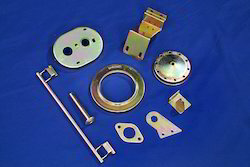 It is widely used in various industries is known to provide an effective, strong connection. Avail this product to our client in a very reasonable price rates. Looking for Exhaust Parts ?